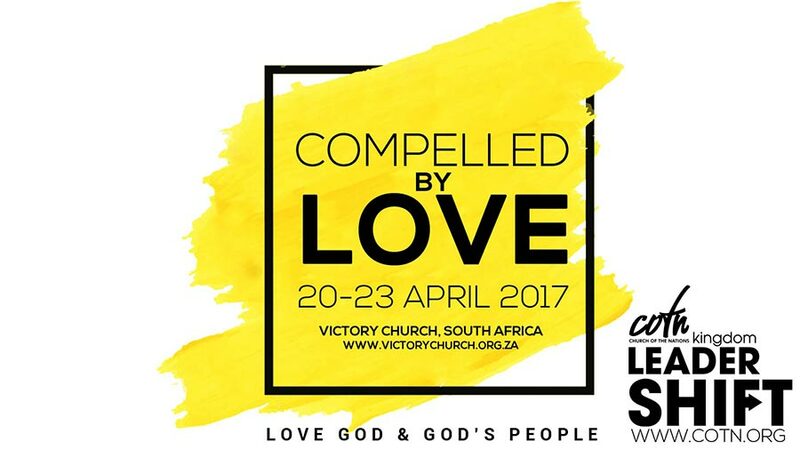 Once again, the leadership of Church of the Nations has put together a phenomenal Leadershift Conference, which will be held, at Victory Church in Jeffreys Bay from the 20th to 23rd April 2017. It remains an honor and a privilege for Victory Church to host this Conference; times like these together are so valuable and much needed. Year after year, this Conference continues to grow both in numbers and significance. This year we are expectant for God to do great things among us and we highly encourage all COTN leadership to attend. We welcome all our pastors, business leaders, community leaders, families, individuals as well as all our special guests. In the day and age that we live in, leadership is vital – wherever you find yourself! It is of utmost importance for us as leaders to continue to develop our leadership skills, abilities, capacities and strategies so that we can lead more effectively. This year’s theme is called Compelled by Love. We trust that over these 3 days, you will feel encouraged, stretched, challenged, motivated and entertained. Make the most of this time together – enjoy the fellowship, make new friends, enjoy the food and leave changed. We look forward to a significant time in His presence as we touch hearts together as a family of apostolic clusters, advancing the Kingdom of God. Download Conference Info PDF here or see below for details. The Conference fees are R375.00 per person. This includes refreshments for the duration of the Conference and a late morning snack on the Friday and Saturday. The Conference fee excludes accommodation. Please find more information regarding accommodation in Jeffreys Bay on the registration page. The cut off date for registrations will be 31 March 2017.